Anyway. The book's protagonist, Kate Winters, lives in a world where people and their communities are isolated, fearful, and ruled over from afar by the mysterious High Council. The country is in the midst of a war that seems to have been going on for ever, and to 'help' the war effort, the High Council send out wardens to take people from their homes and families. No one knows when they'll strike - ten years ago, they took Kate's parents. When the wardens return to Kate's hometown, her uncle Artemis is one of the prisoners taken by the wardens onto the Night Train - but she has other problems to be worried about, what with her being hunted when she finds out she is one of the Skilled; a person cursed with the ability to see both the living and the dead. Along with her friend Edgar, she must run from one of the most feared men alive: the terrifying and sinister Silas Dane. (OK, so I may be a little prejudiced towards Silas. How dare Jenna Burtenshaw sully the name of the best vampire character EVER? I mean the Silas from The Graveyard Book by Neil Gaiman, by the way. But I digress.) Add to that an ancient book called Wintercraft, and a setting that becomes a character in itself (the cities and the country are very vividly described and easy to imagine), and you have a combination of storylines that, given the relatively short length of the book compared to most other YA fiction, create a world that pulls you in from the very first page. Within just a few chapters you have been given enough information, and yet there is enough with-held, to make you very curious about the history of this fantasy world and its characters. Some scenes early on in the book make you think the book is darker than it is, and indeed it does return to this tone later on, but you shouldn't be discouraged if you don't think it's your kind of thing. There is something for everyone in Wintercraft. The plot takes unexpected twists and turns at every corner, but still manages to have a steadiness to it. With so much mystery involved, it's important that it doesn't meander, and Jenna Burtenshaw's writing suits this planned style - she is a very skilled storyteller, especially in her description. It did have it's downfalls, though, and they are obvious enough to really bring down the standard of what could otherwise be an outstanding story. First, and most importantly: I didn't bond with most of the characters. Kate is a little bit too tame for me, and though there are times when she is required to be very courageous, it felt fake. She didn't jump off the page and it affected my desire to finish the story (though I am glad I persevered!) and Edgar, especially, got on my nerves - which isn't something that often happens for me - and I found myself wishing Jenna Burtenshaw had created a stronger secondary character. He did grow on me, but it impacts on a story when a character feels so out of place for so long like it did in this book. However, Silas (and his bird) is such an intriguing and complicated character that his ability to keep you guessing really keeps the reality of the story alive. The other criticism I'd have for Wintercraft is that it's pace was sometimes too slow even for me. 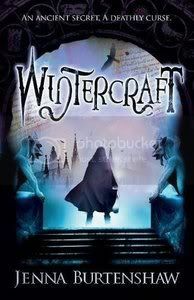 Over all, I think there was a lot of potential in Wintercraft that sadly wasn't utilised - though I also think that it's a very good start to a series that I will definitely be picking up again sometime in the future. In less than five words: fantasy, SILAS!, mysterious, intriguing, promising.